Emily grew up in Indiana and started playing the piano at age five. By the age of 9 she was playing in her school’s orchestra. She was a member of her school’s choir, show choir and pit orchestra for theatrical productions. She also studied ballet and jazz piano. Her educational experiences in the arts afforded her the opportunity to attend Ball State University where she studied Music Education. Emily joined ETM in 2013 and currently teaches at P.S. 169, Baychester Academy in the Bronx. 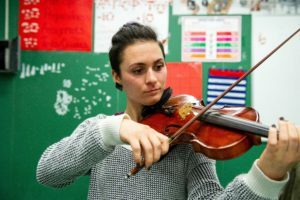 Under her direction, the Baychester Academy Orchestra has grown to 74 fourth and fifth grade students in combined junior and senior ensembles, as well as a third advanced group for students who play their instruments at a beginning-intermediate level. The full ensemble will be featured in this year’s ETM Festival, held at the Lehman Center for the Performing Arts on May 21st.